In practice inference problems often have a complicated and computationally heavy simulator, and one simply cannot run it for millions of times. The Bayesian Optimization for Likelihood-Free Inference BOLFI framework is likely to prove useful in such situation: a statistical model (usually Gaussian process, GP) is created for the discrepancy, and its minimum is inferred with Bayesian optimization. This approach typically reduces the number of required simulator calls by several orders of magnitude. This tutorial demonstrates how to use BOLFI to do LFI in ELFI. 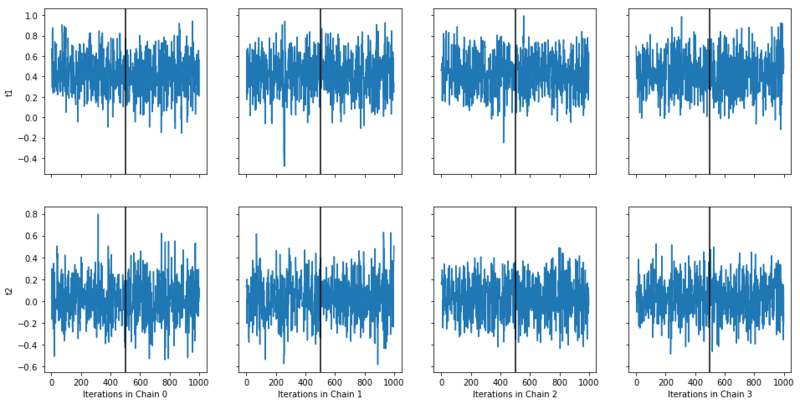 As BOLFI is a more advanced inference method, its interface is also a bit more involved as compared to for example rejection sampling. 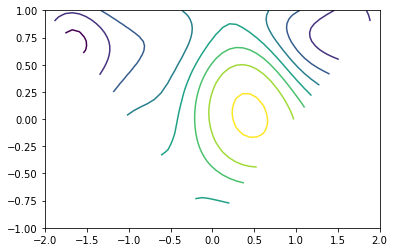 But not much: Using the same graphical model as earlier, the inference could begin by defining a Gaussian process (GP) model, for which ELFI uses the GPy library. This could be given as an elfi.GPyRegression object via the keyword argument target_model. In this case, we are happy with the default that ELFI creates for us when we just give it each parameter some bounds as a dictionary. Other notable arguments include the initial_evidence, which gives the number of initialization points sampled straight from the priors before starting to optimize the acquisition of points, update_interval which defines how often the GP hyperparameters are optimized, and acq_noise_var which defines the diagonal covariance of noise added to the acquired points. Note that in general BOLFI does not benefit from a batch_size higher than one, since the acquisition surface is updated after each batch (especially so if the noise is 0!). Sometimes you may have some samples readily available. You could then initialize the GP model with a dictionary of previous results by giving initial_evidence=result.outputs. The BOLFI class can now try to fit the surrogate model (the GP) to the relationship between parameter values and the resulting discrepancies. We’ll request only 100 evidence points (including the initial_evidence defined above). Note that in spite of the very few simulator runs, fitting the model took longer than any of the previous methods. Indeed, BOLFI is intended for scenarios where the simulator takes a lot of time to run. There could be an unnecessarily high number of points at parameter bounds. These could probably be decreased by lowering the covariance of the noise added to acquired points, defined by the optional acq_noise_var argument for the BOLFI constructor. Another possibility could be to add virtual derivative observations at the borders, though not yet implemented in ELFI. Finally, samples from the posterior can be acquired with an MCMC sampler. By default it runs 4 chains, and half of the requested samples are spent in adaptation/warmup. Note that depending on the smoothness of the GP approximation, the number of priors, their gradients etc., this may be slow. INFO:elfi.methods.mcmc:NUTS: Performing 1000 iterations with 500 adaptation steps. INFO:elfi.methods.mcmc:NUTS: Acceptance ratio: 0.423. After warmup 68 proposals were outside of the region allowed by priors and rejected, decreasing acceptance ratio. INFO:elfi.methods.mcmc:NUTS: Acceptance ratio: 0.422. After warmup 71 proposals were outside of the region allowed by priors and rejected, decreasing acceptance ratio. INFO:elfi.methods.mcmc:NUTS: Acceptance ratio: 0.419. After warmup 65 proposals were outside of the region allowed by priors and rejected, decreasing acceptance ratio. INFO:elfi.methods.mcmc:NUTS: Acceptance ratio: 0.439. After warmup 66 proposals were outside of the region allowed by priors and rejected, decreasing acceptance ratio. The sampling algorithms may be fine-tuned with some parameters. The default No-U-Turn-Sampler is a sophisticated algorithm, and in some cases one may get warnings about diverged proposals, which are signs that something may be wrong and should be investigated. It is good to understand the cause of these warnings although they don’t automatically mean that the results are unreliable. You could try rerunning the sample method with a higher target probability target_prob during adaptation, as its default 0.6 may be inadequate for a non-smooth posteriors, but this will slow down the sampling. Note also that since MCMC proposals outside the region allowed by either the model priors or GP bounds are rejected, a tight domain may lead to suboptimal overall acceptance ratio. In our MA2 case the prior defines a triangle-shaped uniform support for the posterior, making it a good example of a difficult model for the NUTS algorithm. The black vertical lines indicate the end of warmup, which by default is half of the number of iterations.